Great Lakes Color Producing Agent Products (Science Quality) are available on CoastWatch web site. The new products produced by NESDIS STAR, which includes Chlorophyll, Dissolved Organic Carbon (DOC), Colored Dissolved Organic Matter (CDOM), Suspended Minerals (SM). The products available in geotif, png format. Lake Michigan Upwelling Imagery (Experimental) is currently available. Great Lakes Color Producing Agent Products (Experimental) are available on CoastWatch web site. The new products includes Chlorophyll, Dissolved Organic Carbon (DOC), Colored Dissolved Organic Matter (CDOM), Suspended Minerals (SM),Photic Zone Depth, and KD490. The products available in geotif, png, and netCDF format. Great Lakes ERDDAP Server is implemented and currently available on the Great Lakes CoastWatch web site. Great Lakes THREDDS Server is implemented and currently available on the Great Lakes CoastWatch web site. Great Lakes RealEarth Server is implemented and currently available on realearth.ssec.wisc.edu. The GLERL Internet will be down for upgrade on Tuesday October 18, 2016 from approximately 7:00 am to noon. The CoastWatch server will be down on Monday morning (October 3) starting at 7:00am for about 2 hours. Great Lakes CoastWatch is switching to a new web server this week (June, 6 - June 10). Web services for the Great Lakes CoastWatch web site may be intermittent during this time period. Apologies for any inconvenience this may cause and thank you for your patience. VIIRS Satellite SST data (1024x1024) has been added to Great Lakes Surface Environmental Analysis. The GLSEA is produced daily from near real-time, cloud masked and mapped satellite AVHRR and VIIRS SST data using the new compositing algorithm (2007). Ice cover concentration from the Great Lakes Ice Analysis produced by the National Ice Center (NIC) is overlaid during winter months. VIIRS Satellite Imagery is currently available. Owing to Merit Internet Service scheduled maintenance, the CoastWatch Great Lakes website will be unavailable between the hours of 7:30 am to 3:30 pm on Sunday, October 4th. GLERL IT Team will be doing a full reconfiguration of the server room this weekend (July, 25 - July 26). This means that all services including Great Lakes CoastWatch web site will be intermittent during this time period. Owing to network redesign and maintenance, there may be sporadic and extended disruptions to the CoastWatch Great Lakes website starting Monday evening September 22, 2014. NOAA-16 (launched on September, 21 2000, 10:22 UTC) was decommissioned on June 10, 2014. Imagery from NOAA-16 is not been available at the Great Lakes CoastWatch node since June 20, 2009. Imagery from Metop-B (fully operational on April 24, 2013) has been available since January 17, 2013. Following almost 11 years of service NOAA-17 (NOAA-M prior to launch) will be decommissioned on April 10, 2013. Imagery from NOAA-17 is not been available at the Great Lakes CoastWatch node since September 28, 2010. GOES-13 remains in an Earth pointing nominal attitude with the Imager and Sounder in Standby modes while the September 23 anomaly is being investigated. No estimate on return to operations at this time. Cause and corrective actions are under investigation. Only routine imaging schedules are currently available for GOES-14; however, rapid scan (RSO) schedules will be available beginning on September 26, 2012 at 0144 UTC (in the event of severe weather). GOES-14 is stationary at 105 degrees West with no current plans to drift east. Starting on August 23, 2010, surface water temperature composite charts, from 2003 to current year, are available in full resolution (1024x1024). Starting on February 19, 2009, AVHRR images from METOP-2 have been added to the Great Lakes CoastWatch suite of products. Starting on June 22, 2009, AVHRR images from the newly launched NOAA-19 satellite have been added to Great Lakes CoastWatch suite of products. Starting June 19, 2009, AVHRR images from NOAA-16 are no longer available. Great Lakes average ice concentration data and graphs are currently been produced from the biweekly NIC/Canadian Ice Service Great Lakes Ice Analysis Charts and are available at http://coastwatch.glerl.noaa.gov/statistic/statistic.html. Please be advised that all GLERL sites will be unavailable starting sometime on Monday, December 22, 2008 and continuing into Wednesday, December 24, 2008. GLERL will be relocating to its new facility at 4840 S. State Rd., Ann Arbor during this time period. The outage may last longer if we encounter problems during the move. The CoastWatch Great Lakes server is being upgraded. You may experience intermittent problems accessing the CW Great Lakes web site during this period of upgrade. We apologize for any inconvenience this may cause and thank you for being patient during this period of upgrade to the server. The Great Lakes Surface Environmental Analysis (GLSEA) surface water temperature composite chart is now available in full resolution (1024 x 1024) in both .png and ascii formats. The new GLSEA is produced daily from near real-time, cloud masked and mapped AVHRR satellite SST data using a new compositing algorithm. Ice cover concentration from the Great Lakes Ice Analysis produced by the National Ice Center (NIC) will be overlaid during winter months. A new version of CoastWatch Software Library and Utilities v3.2.1 Tools is available for download from the "Software" page on the Great Lakes CoastWatch web site. Glsea_reader.sav is a IDL binary file for PC, that convert Great Lakes Surface Environmental Analysis (GLSEA) file from gif format to asc (txt) format. A new version of CoastWatch Software Library and Utilities v3.1.9 Tools is available for download from the "Software" page on the Great Lakes CoastWatch web site. Support for rendering line and polygon data from ESRI shapefiles. Support for transparency in graphics overlay colors, useful when rendering "highlight" polygons. Log enhancement scaling in CDAT for use in chlorophyll plotting. GIF image output in CDAT and cwrender. Support for AVHRR NOAA 1b version 3 files. New tool for automatic navigational correction using image data. Improved manual page documentation and command-line usage notes via "-h" option. Bug fixes for CDAT in PDF and image rendering code. Updated icon set and Unix/Linux look-and-feel. Updated code for cleaning up partially written files after command-line tool failure. A new version of CoastWatch Software Library and Utilities v3.1.7 Tools is available for download from the "Software" page on the Great Lakes CoastWatch web site. Integration of the CoastWatch Data Analysis Tool (CDAT) into the package. CDAT is a graphical tool that allows users to view and convert CoastWatch data visually. CDAT now has annotation and navigational correction capabilities, online help, GeoTIFF output, topography overlays, generic bitmask overlays, overlay group save and restore, support for swath files, and more. Easier to use installation packages. Windows users no longer need to edit batch files -- just run the self-installing executable. Unix users have the option of a self-installing shell script. Linux users can install from an RPM file. The graphical tools now have an update agent built into them so that users are informed on startup if there is a newer release available online. 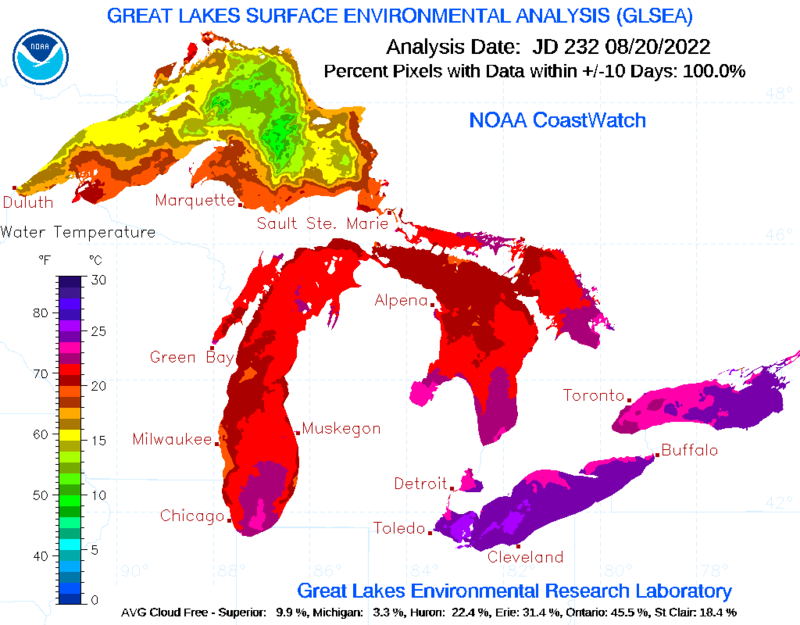 On March 17, the Great Lakes Surface Environmental Analysis (GLSEA) composite temperature chart produced from data in the new .hdf file format replaced the GLSEA made from the old .cwf data. The GLSEA composite charts produced from the .hdf file data are available online back to Jan. 1, 2004. The previous 365 day GLSEA animation currently includes images made from both .cwf and .hdf format data. 24 hour forecast wind fields produced by the Great Lakes Coastal Forecast System (GLCFS) are available online daily, and are also available as an overlay for the most recent image in the JAVA GIS utility. A user name and password are no longer necessary to access the CoastWatch AVHRR near real-time satellite imagery or the JAVA GIS online utility. The synoptic scene (including all the Great Lakes) is now 1024 x 1024 pixels in size. The Lake Superior, Lake Michigan/Huron, and Lake Erie/Ontario scenes are still available at 512 x 512 pixels. JAVA GIS is an online JAVA based utility to view and perform basic analysis on the AVHRR imagery. In addition, other image manipulation and analysis software such as the CoastWatch Data Analysis Tool (CDAT) and Utilities v3.1.5 Tools , which allow visualization and basic analysis of both the old (.cwf) and the new (.hdf) image files, are available to download to your computer. The Great Lakes CoastWatch web site will be unavailable starting at about 4:00pm (EST) Wednesday, August 20 while it is being upgraded. It should be back online Thursday August 21. A new version of CoastWatch Software Library and Utilities v3.1.3 Tools is available for download from the "Software" page on the Great Lakes CoastWatch web site. These tools are used to perform satellite data related tasks from the command line. Most tools support both the new CoastWatch HDF format and the older CoastWatch IMGMAP format by automatically detecting the file type. The Great Lakes CoastWatch node began receiving NOAA-17 AVHRR satellite imagery on Thursday October 17. The initial daytime image [2002_290_1530_n17_gl_d1.cwf] was received at 1:24pm EST on 10/17, and the initial nighttime image [2002_291_0250_n17_gl_s7.cwf] at 12:32am EST on Friday 10/18. The SAA has started its transition to becoming the Comprehensive Large Array-data Stewardship System (CLASS) by combining the SAA Web Interface Gateway (SWIG), NOAA Coast Watch Active Access System (NCAAS), and Live Active Server (LAS) into a single web interface. It is now available for your use at www.saa.noaa.gov. Use the following link to the NOAA National Weather Service (NWS) Forecast Office in Grand Rapids, MI http://www.crh.noaa.gov/grr/ to access observed nowcast and model forecast winds and waves on the Great Lakes. A new version of CDAT ( CoastWatch Data Analysis Tool ) is available for download from the "Software" page on the Great Lakes CoastWatch web site. This version of the CDAT viewing and analysis tool has a new export capability and the ability to perform color compositing by combining variable data into red / green / blue composite images. If using the WINDOWS version, download the WINDOWS DLL files and install them in \WINDOWS\SYSTEM for WINDOWS 9x or \WINDOWS\SYSTEM32 for WINDOWS NT/2000. The CoastWatch Data Analysis Tool (CDAT) is a data visualization program with a graphical interface that allows users to view and perform simple analysis on CoastWatch and other satellite data. CDAT is currently under development, but is available in a number of versions for Unix and Windows platforms. A new water surface temperature image product derived from NOAA's Geoststionary Operational Environmental Satellites (GOES) has been introduced on the Great Lakes CoastWatch web site (http://coastwatch.glerl.noaa.gov/goes/goes_sst.php). A 3-hour composite image produced by combining three separate images, each created 1-hour apart, and retaining the most recent temperature value is shown using color to depict temperature values. The Great Lakes CoastWatch node began receiving NOAA-16 AVHRR satellite imagery on Thursday February 22nd. The initial daytime image [g0105318.ld1] was received at 14:33 EST on 2/22, and the initial nighttime image [g0105407.ls7] at 03:02 EST on Friday 2/23. The cwftoarc utility converts CoastWatch data files to either an ASCII or binary GRID file for use in the ArcView or ARC/INFO GIS packages from Environmental Systems Research Institute, Inc. The User's Guide is available in PDF or PostScript format. The International Association for Great Lakes Research invites you to participate in its 44th Annual Conference titled "Great Lakes Science: Making it Relevant." The conference, hosted by the University of Wisconsin-Green Bay (UWGB) in partnership with the University of Wisconsin Sea Grant Institute, will be held at the UWGB campus in Green Bay, Wisconsin, USA from June 10th to June 14th , 2001. All abstracts must be submitted via IAGLR's improved Abstract Submission Center. The submission deadline is Friday, December 15, 2000. New for this year, you may review and edit your submitted abstracts online through Thursday, February 15, 2001. Abstracts are limited to a maximum of 200 words (about 1,350 characters). Please write your abstract for a general audience. (i.e., As much as possible, try to make your abstract readable for people outside your field.) You are responsible for all grammatical errors, and so are encouraged to review your submitted abstract very carefully. A Bathymetry image has been added to the JAVA GIS utility to complement the bathymetry shapefiles. Derived from the GLERL digital bathymetry database (Computerized Bathymetry and Shore Lines of the Great Lakes, NOAA Data Report ERL GLERL-16, 1980), the bathymetry image allows the user to find depth at the cursor position as well as to overlay shapefiles on the bathymetry image. The expected duration of any potential outage is 20 minutes during the above window. A new utility, based on a JAVA applet, allows interactive retrieval of physical parameters such as surface temperature, ice cover, winds, and lake bottom depth at a given location in an image, which enhances the accessibility and utility of Great Lakes CoastWatch data. The applet is initiated using the JAVA GIS button on the Great Lakes CoastWatch home page (use your CoastWatch username and password to access). A window will appear in which you can specify an image type and date, overlay (shapefile) data, or the URL of a custom shapefile to be viewed. Current image data includes near real-time NOAA AVHRR surface temperature data, Channel 1 visible reflectance data, and GLSEA (Great Lakes Surface Environmental Analysis) cloud-free composited surface temperature data. Ice concentration data is available during the winter season. Shapefiles include shoreline, bathymetry, and state boundary/land mask overlays. Once the image type and date are chosen, select and load desired shapefiles, then press the start button. Two new windows (Panner window and Image window) and a Control Panel window will appear on your screen. Scroll and zoom options are available using the Panner and Image windows. Overlays (shapefiles) are turned on and off using the Control Panel. Overlay colors can be changed to enhance visibility. In addition, near real-time NOAAPort marine observation data at buoy, CMAN, and Coast Guard shore station locations and/or nowcast gridded winds (at the hour of the displayed satellite image) can be displayed and observed values obtained by moving the cursor over the station or wind vector of interest. A fast Internet connection and the Netscape Communicator browser are recommended for best results using this JAVA applet. Analyzed Wind Fields produced by the Great Lakes Coastal Forecasting System (GLCFS) have been added to the "In Situ Data" page under "Great Lakes NOAAPort Marine Observation Data". Hourly analyzed wind fields for the past 24 hours (-24 to 00 nowcast) are available in addition to a 24 hour animation in .flc format ( use AAPLAY to view ). Previous 365 days GLSEA Average Surface Water Temperature for each lake. Average GLSEA Surface Water Temperature Graphs for each lake for the previous 5 years and for all lakes for each of the previous 5 years. Average GLSEA Surface Water Temperature Data for each lake for the previous 5 years. GLERL's connection to the Internet will be unavailable for 2 hours next Wednesday morning, 6/30/99 5:00-7:00 A.M. while Merit Network moves GLERL's circuit to their new building. Raw marine observations for the Great Lakes region are obtained via satellite transmission from the NOAAPort broadcast system. The NOAAPort broadcast system provides a one-way broadcast communication of NOAA environmental data and information in near-real time to NOAA and external users. This broadcast service is implemented by a commercial provider of satellite communications utilizing C-band. These raw NOAAPort observations, acquired hourly by the Great Lakes CoastWatch node, are decoded and processed to produce various data files, timeseries plots, and interactive imagemaps. The Great Lakes surface observation network is comprised of 205 fixed stations including 18 moored buoys, 11 Coastal Marine Automated Network (CMAN) stations, 35 US Coast Guard stations, 21 Other Marine Reports (OMR) stations, and 120 surface airways stations. In addition, many commercial cargo ships and Coast Guard vessels provide regular meteorological reports. Frequency of observational reporting ranges from about once every 3 hours to 3-5 times per hour depending on the type of station. The Great Lakes CoastWatch data base includes the following information extracted from NOAAPort observations: air temperature, dew point, wind direction, wind speed, maximum wind gust, cloud cover, air pressure, water temperature, wave height, and wave period. During a typical summer day, the marine observation data includes about 300 buoy observations, 3500 observations from land stations, and about 300 reports from vessels. NOAA-14 equator crossing time has now slipped to about 3:10 PM local time. This drift is changing at a rate of roughly 3 minutes per month. By December, 1999 the equator crossing will be about 3:40 PM and by July of 2000 it will be 4:10 PM. NESDIS is considering impacts of the drift on operational satellite data users and will decide when to launch the next afternoon satellite (NOAA-L). Beginning March 9, 1999, NOAA-15 will enter into a six week period of limited switching of AVHRR channel 3A/3B for collection of 3A data over areas of snow and ice in the northern hemisphere. It may mean that some channel 3 products will not be received by the nodes and the archive. Other products should have minimal impact. -- all Great Lakes CoastWatch satellite (AVHRR) temperature and reflectance data available for viewing and download via the web site. -- SatView - a Java based interactive analysis tool for CoastWatch AVHRR temperature and reflectance imagery. -- the Great Lakes Surface Environmental Analysis (GLSEA) composite temperature chart has winter ice cover concentration (from the National Ice Center (NIC) Great Lakes Ice Analysis). -- yearly and last 365 day animation's of the daily GLSEA chart in QT, FLC, and AVI formats. -- Great Lakes Forecasting System nowcasts and forecasts of numerous lake parameters (currents, wave height, etc.). -- links to numerous web sites for complimentary data including Great Lakes bathymetry, water levels, buoy data, weather data, etc. As in the past, Great Lakes CoastWatch continues to supply Michigan Sea Grant with near real-time satellite imagery for its contoured water surface temperature product, available via a link to the Michigan Sea Grant web site. A signed Memorandum of Agreement (MOA) is no longer needed to access CoastWatch near real-time satellite (AVHRR) imagery. Currently, only a username and password, which can be generated and obtained interactively upon visiting the web site, are necessary for access. Your username and password are valid for all future access. (Note: RADARSAT imagery has limited access owing to the proprietary nature of this data.). Other data types and products do not require a username and password for access. Although still under construction, our goal is to develop a comprehensive web site for access to near real-time and retrospective satellite and in situ environmental data and products to meet the needs of various users for environmental monitoring, decision making, research, and recreational uses.